We had Arroz Clásico as side with dinner tonight. Heading off to do errands I decided to leave myself a ‘breadcrumb’ to remind me that I was helping with dinner tonight so I placed the container of rice on the kitchen counter. When I returned from errands we went to the fitness center. Returning home I told Don that I was going to get the rice started so it would be thoroughly cooked and tender. He mentioned that he had noticed the container that I had placed on the counter. And then he added that since we had planned and discussed Arroz Clásico he felt that the macaroni container was in error and had replaced it with the rice container. It is so reassuring that when you get flakey there is someone to cover your back! While I was peeling, trimming and slicing the onion with tears running down my checks and sniffling away I remembered my Dad called these ‘mean’ onions. Then my attention wandered on over to the kitchen sink colander, a Christmas stocking stuffer that is becoming another favorite kitchen gadget. 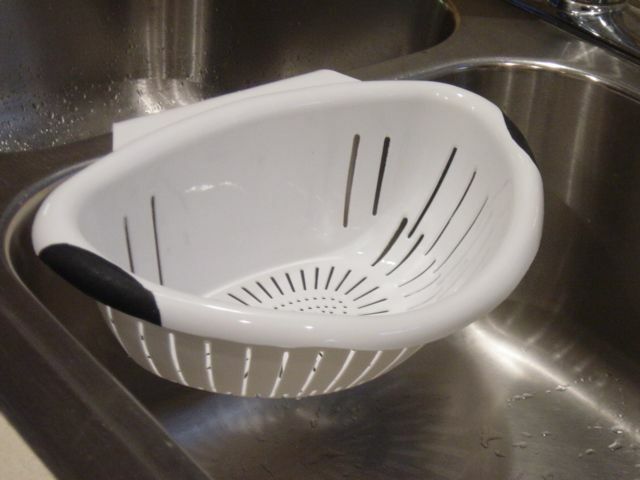 Colanders in the sink used to be standard equipment before the days of garbage disposals. All the peelings, cores, and trimmings went in the colander to drain before being trashed or composted. We had a septic tank at our place the country and didn’t have a disposal. When we moved we chose not to use the one already in this house. I run the disposal to clean it out occasionally but had started using a lot of paper towels to bundle the stuff that goes in the trash. That is not really green or earth friendly, is it? I like the way this colander hooks over the center of the sink and is right under the water spigot if needed. So now we are saving on paper towels. When I get my act together there will be even less paper. Another thing that was really great about this product – it was part of a school fundraiser for one of the grandchildren. No high calorie, high fat candy bars or cookie dough – this is something useful and reusable. 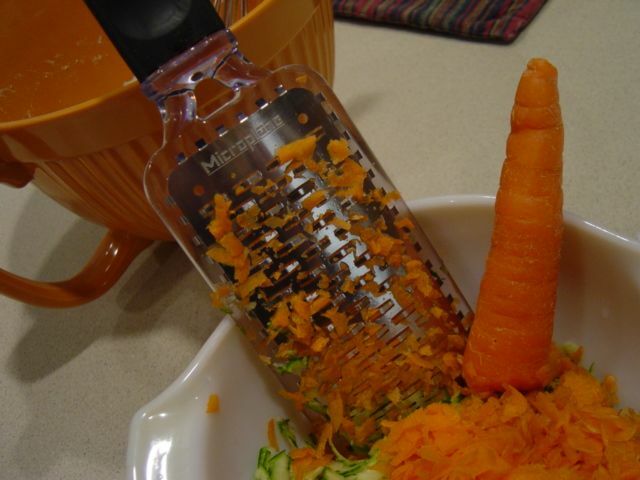 This grater is another one of my favorite manual kitchen tools. I’ve had it for several years and find that it handles most of my grating needs. For a while I thought I really needed to buy a zester, and truthfully, I would still like to have one. But when it came down to lemon zest or no lemon zest this grater filled in quite nicely. I first discovered Microplane when Don and I lived in the country and I was going through a woodworking/furniture and bookcase building phase – it may have been just before or after the peach preserves episode. Anyway, my first Microplane was a fantastic wood rasp that cut with both forward and backward motion. 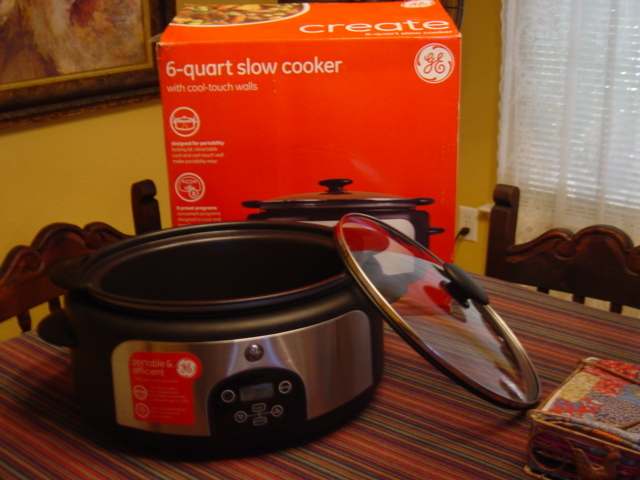 Creative chefs discovered them and began to use them in the kitchen. For a while Italian restaurants had their wait staff shaving cheese at the table with these flat graters until the more efficient rotary version came along. The zucchini and carrots just fell right through into the bowl. While the apple seemed softer and juicier the fiber structure held on in back of the grater so that the pulp needed to be scraped off with a spoon – no biggie. The ‘teeth’ on this grater are constructed in such a way that it would be difficult to injure yourself while using it. I did scrap the side of my hand once in a severely clumsy move that spilled the bowl and contents all over the kitchen counter. The scrap was such that it did not notice it until evening when it bled a bit in the shower and I had to think back to when it might have happened – very minor wound indeed. A customer product review says that after a couple of years it comes apart in the dishwasher. It is so easy to clean up that I never thought about putting it in the dishwasher. There is a Gourmet Series and a Professional Series if you need something for heavy duty use. This one stands up to use in my kitchen. For the first time ever (that I can remember) this Thanksgiving will not be held with members of my own family. I don’t feel bad about this only because I have already had two fun-filled weekends this month with my wonderful family. The first weekend of November featured my children and their family members that could be here. The second weekend was a gathering with my siblings and their spouses and three nieces in Norman, Oklahoma. It was everything that you can imagine from such a diverse group 🙂 . So the only baking this week is a fresh batch of Don’s ‘golf food’ which is definitely not on the gluten-free list. When he first started playing golf he bought crackers and snacks out of the vending machines at the pro shop. In search of better options I began playing around with recipes that he liked and eventually a favorite spice cake morphed into even spicier raisin-filled muffins. His golfing buddies profess golf-food envy but he never shares. So with no cooking to be done I decided to write about my love of simple kitchen tools – those go-to, every-day, run-of-the-mill implements, simple in design but yet you-get-a-little-crazy if you can’t find it when you need it. Even though I am contemplating the purchase of a very modest food processor I have a special feeling for hand tools – no electricity or batteries required. They work when all else fails. Perhaps this preference came about from working in the kitchen with my paternal grandmother who raised her own chickens and vegetables, canned her own produce, and baked her own bread. Or maybe it was that five-days-iced-in-without-power, trees exploding in the yard with only the telephone, fireplace, and propane-camp-stove-on-the-dining-table experience when we lived in the country. My favorite can opener is called a ‘lid lifter’ because the lid does not fall into your food. The cutter part is quirky only because you might be accustomed to the type that produces sharp edges. Once you get the hang of how to set the tool on the can you simply turn the handle and the lid-lifter separates the seam on the side where the lid and can come together. No sharp edges and no lid in the can! If the lid is stuck (some kind of can glue) there is a tiny grabber that will lift the lid right off!! 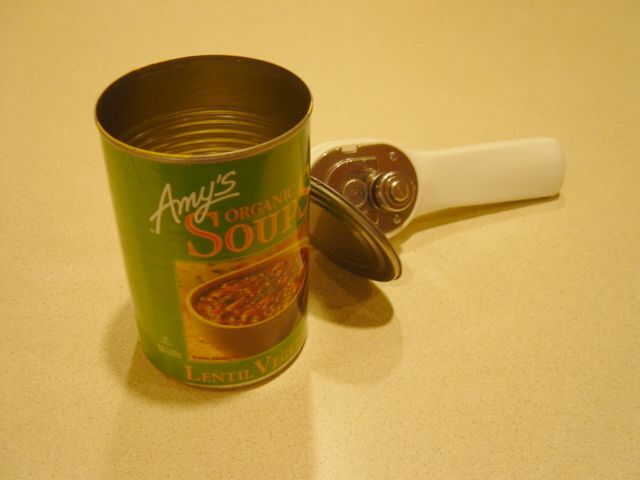 No more worries over washing the can tops or keeping bandages in the drawer for can opener mishaps. And still Don prefers and uses only the electric can opener – men and their power tool fetish extends even to the kitchen. Just wait until we have a power failure!